The GSLV Mk.2 rocket fired into space from the Satish Dhawan Space Center with nearly 1.8 million pounds of thrust at 1040 GMT (5:40 a.m. EST; 4:10 p.m. Indian Standard Time), soaring into a clear afternoon sky at the spaceport, located on India’s southeastern coast just north of Chennai. 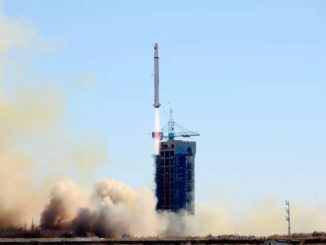 The rocket’s solid-fueled core stage and four strap-on boosters consumed their propellants in the first two-and-a-half minutes of the flight, and a High Thrust Vikas Engine ignited with 190,000 pounds of thrust to continue the climb into orbit. The GSLV’s cryogenic upper stage fired up around five minutes into the mission for a 14-minute burn. Moments after shutdown of the hydrogen-fueled upper stage, the GSLV Mk.2 deployed the 4,960-pound (2,250-kilogram) GSAT 7A military communications satellite in a supersynchronous transfer orbit at 1059 GMT (5:59 a.m. EST). The upper stage engine was commanded to fire until it depleted its propellant supply, rather than targeting a specific altitude, to release the GSAT 7A satellite the highest orbit possible and reduce the spacecraft’s fuel consumption to reach its final operational perch in geostationary orbit more than 22,000 miles (nearly 36,000 kilometers) over the equator. “Today, GSLV successfully and safely injected the advanced communications satellite GSAT 7A in a supersynchronous transfer orbit,” Sivan said. 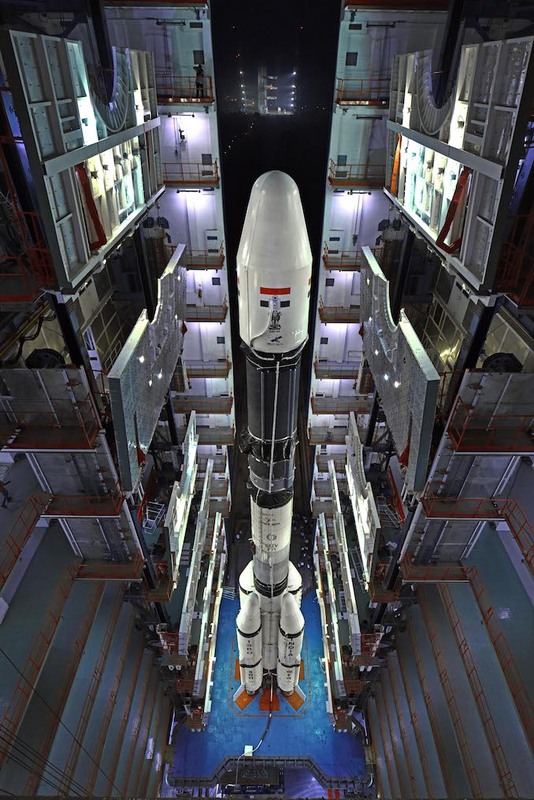 “GSAT 7A is the third communications satellite India has launched in 35 days, and this is the heaviest satellite lifted by GSLV with the indigenous cryogenic stage. A commentator on ISRO’s live launch webcast reported the rocket placed GSAT 7A in an orbit with a perigee, or low point, of 106 miles (171 kilometers), an apogee, or high point, of 24,233 miles (39,000 kilometers), and an inclination of 19.37 degrees. GSAT 7A’s on-board engine will maneuver the satellite into a circular geostationary orbit over the equator at 63 degrees east longitude, according to ISRO. Wednesday’s mission by the GSLV Mk.2 came after a rapid-fire pace of Indian space missions, beginning Nov. 14 with the second orbital test flight of the GSLV Mk.3 — India’s biggest rocket — and followed Nov. 29 (Indian time) with the liftoff of a Polar Satellite Launch Vehicle with a hyperspectral Earth-imaging satellite and 30 secondary payloads. India’s heaviest satellite, named GSAT 11, lifted off Dec. 4 aboard a European Ariane 5 rocket from French Guiana. ISRO ends 2018 with seven successful space launches from India’s spaceport, tying a record set in 2016 for the most Indian space launches in a year. The GSLV mission Wednesday — designated GSLV-F11 — was the second launch with a High Thrust Vikas Engine on the rocket’s second stage. 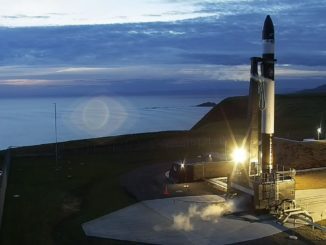 The hydrazine-fed second stage also employed electromechanical actuators powered by lithium-ion batteries, replacing hydraulic systems used on past missions. The technology change makes the rocket more reliable, Indian officials said. The higher-thrust engine and electromechanical actuators debuted on the GSLV Mk.2’s previous flight March 29. “This GSLV-F11 is not yet another GSLV but it is an improved version fo the GSLV, where we have brought changes in the cryogenic stage as well as in the second stage of the vehicle to improve the payload capability,” said S. Somanath, director of Vikram Sarabhai Space Center, headquarters for ISRO’s launcher development programs. The GSLV Mk.2 launched Wednesday stood 5.9 feet (1.8 meters) taller than earlier GSLV Mk.2 rockets to accommodate the extra propellants. Engineers had to analyze the aerodynamics and control behavior of the taller rocket before deeming it ready to fly, Somanath said. 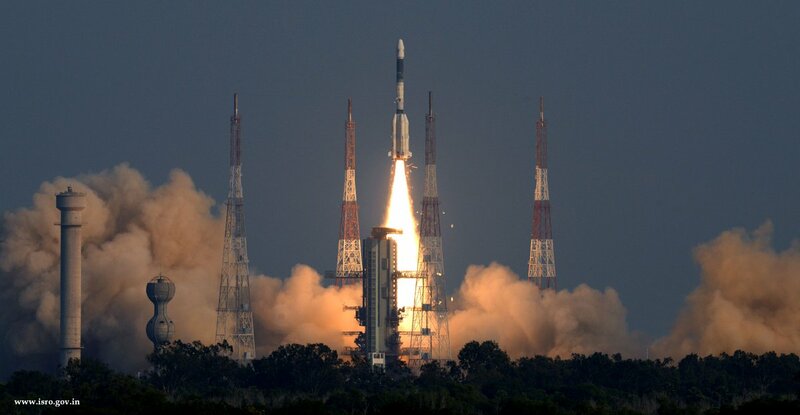 “This is the sixth consecutive successful GSLV (Mk.2), and it shows that this vehicle is going to stay longer to make more missions in the years to come, with improved capability,” Somanath said. Future GSLV Mk.2 upgrades include a bigger payload compartment to accommodate larger satellites, according to Somanath. ISRO also plans to introduce the High Thrust Vikas Engine to the GSLV Mk.2’s four strap-on boosters. 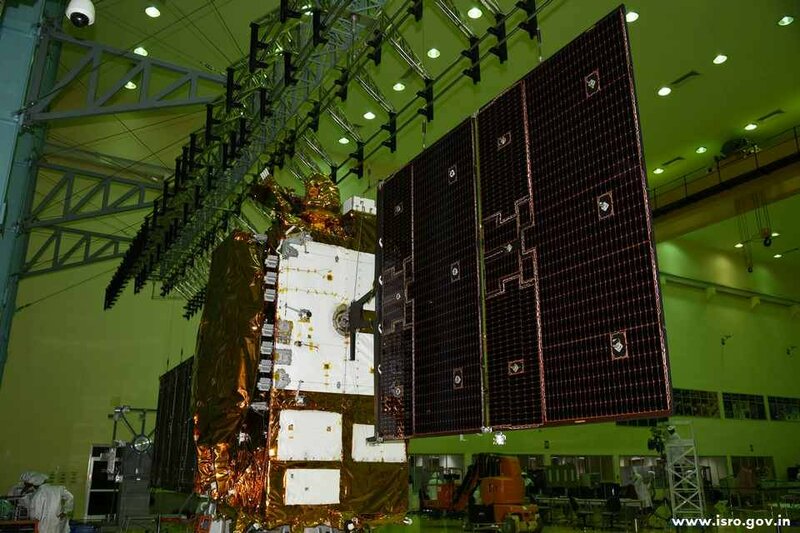 The Times of India, a major English-language newspaper in the country, reported that the GSAT 7A satellite will serve the Indian Air Force by connecting ground radar stations, airbases and airborne command and control aircraft. GSAT 7A will also support Indian Air Force drone operations, helping convert the military’s remotely-piloted aircraft from ground control to satellite control networks. GSAT 7A was preceded by the GSAT 7 satellite launched in 2013. GSAT 7 was built to provide communications for the Indian Navy. Indian officials said in remarks Wednesday that GSAT 7A carries four steerable antennas and a shaped beam to cover the Indian subcontinent with 10 transponders.